July has always been an odd feeling month for me. It’s normally hot and dry, leaving me disgruntled about the state of my garden and slightly rooted in depression. But this crazy July saw not one but two cold fronts and a five inch rain. I still felt a bit depressed, out of habit I suppose. The month actually started out with a week of vacation for me so at least for a week I got everything mowed, plowed, picked, and planted. At the end of my working “staycation” (the only kind I know), I made a trip to Hammond, Louisiana to visit the LSU Hammond Research Station there. 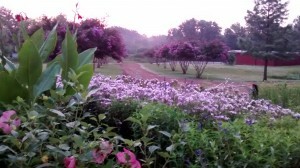 Friend Allen Owings and company have done a great job creating a nice trial and display garden. I also got a lesson in making authentic corn maque choux from a true (and good looking) Cajun cook. Yummy. 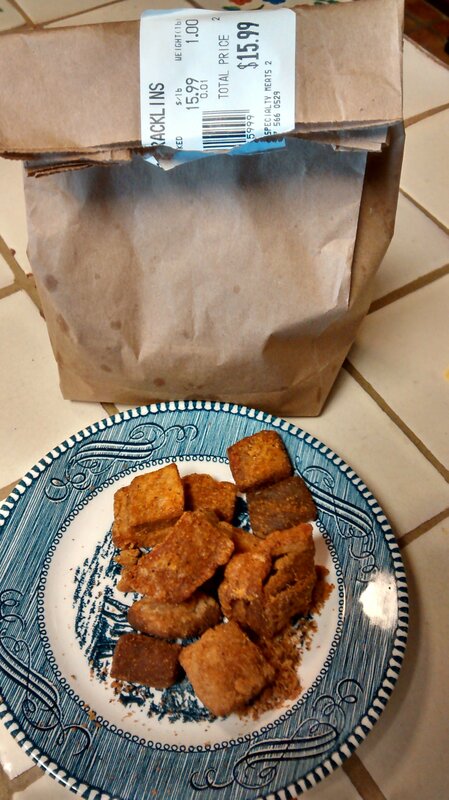 An extra special treat was stopping again at Kartchner’s Grocery in Krotz Springs for the best boudin balls (made with shredded pork) and cracklings that are to die for. The cracklings over there have meat attached to them! I now remember why my papaw sliced the fat off of baked country ham and ate it. It was all I could do to keep from making myself sick on the way home. I was in a hurry to get back to the local Pleasant Grove Cemetery homecoming to visit with both living and dead friends and relatives. Reluctantly I settled back in at the job where former LSU horticulturist and food technologist Paul Wilson presented a program on salsa at our monthly SFA Gardens lecture series. With a bumper crop of tomatoes it’s always nice to get ideas on how to store and prepare them. 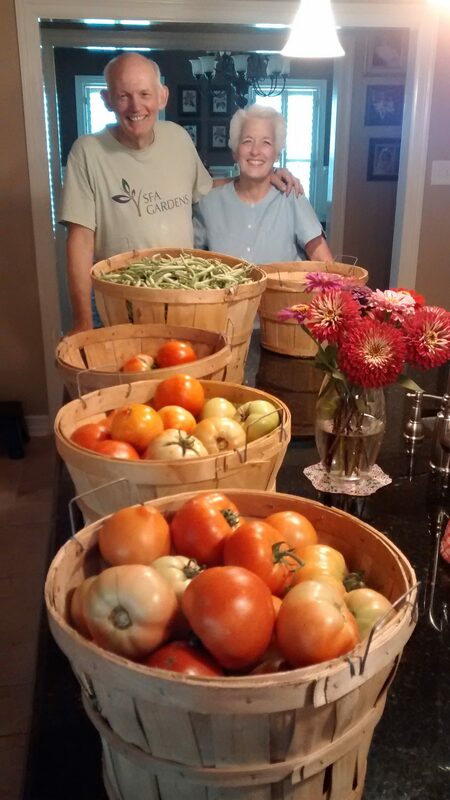 My good friend Bill Jobe also did extremely well with his Tycoon and Valley Cat tomatoes from Dr. Jerry Parsons. Unfortunately Bill’s sweet wife Mary Louise was at a loss for what to do with several bushels of tomatoes at a time! I picked a half bushel each harvest off five plants but Bill decided to plant a whole row at his “share cropper” farm in Appleby. I keep telling him if you use productive varieties it doesn’t take much space. My friend Mark Holl from SFA got his tomatoes out late but planted a plethora of mainly processing type varieties in his Nacogdoches garden. He and his wife have them crammed into raised beds scattered with giant sunflowers and yard art. My two rows of purple hull peas ripened in July. After one pan of hand shelling I got lazy and drug out the electric pea sheller though. I actually like to shell peas, but I think I’d rather be retired and in a rocking chair to truly take time to savor it. My late legendary boss Joe Bradberry at Lone Star Growers in San Antonio also liked to shell peas, something he picked up being raised in rural Alabama. I have three rows of an experimental pea I’m trying to develop but who knows how they will turn out. It’s a seedling from my papaw’s black crowders, but I’m selecting for purple hulls and maroon and white blotched Aggie peas! Unfortunately any that don’t fit the criteria get pulled up and discarded making those passing by think I’m insane for pulling up most of a perfectly good patch of peas. I can’t have the bad guys pollinating the good ones and certainly don’t want to save their off colored seed. If I had to start my career over I’d be a true plant developer instead of a dabbler. The rain helped my crapemyrtle alleé make a nice second show along with another round of blooms on the ‘Ellen Bosanquet’ crinums. It also brought out the first of my spider lily parade with a nice display from the big pink Lycoris squamigera and the delicate striped Lycoris x incarnata. Unfortunately I had to quickly pick the Lycoris squamigera and cram them into a fruit jar since I was bush hogging the messy meadow out front where they were blooming. 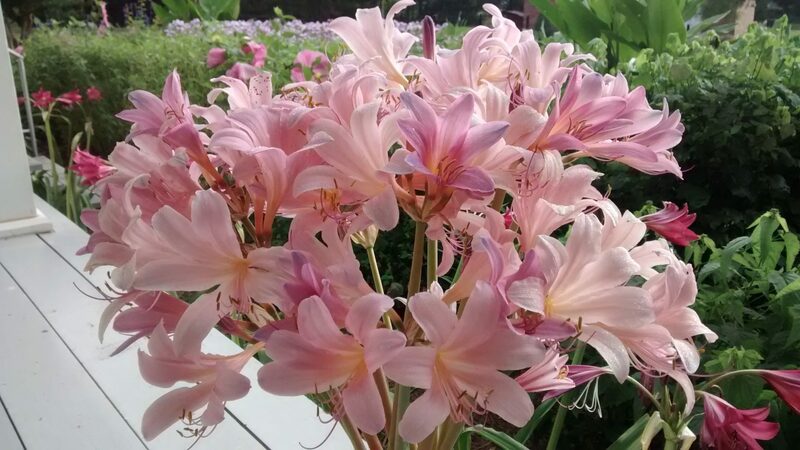 It’s easy to see why they are called naked ladies, resurrection lilies, and magic lilies. Spider lilies do seem like magic to me and always entice me out of my summer slump with most of the species and cultivars peaking in September, after the oxblood lilies. My naturalized Philippine lilies also made their annual show in late July. They are most enjoyable at night when their fragrance peaks and they are being pollinated by sphinx moths. My Belle of Georgia peaches and Celeste figs also ripened in July. Sadly the five inch rain ruined many of the figs, causing them to split and sour. The entire garden smelled like soured figs for a week. Luckily having five terriers each night has kept the usual hungry parade of raccoons and opossums at bay. Belle of Georgia is an old white fleshed cultivar of peach introduced in 1870. I love its mild, sweet flavor. One entire limb broke out of the tree under the weight of the peaches but I still managed to pick a half bushel of peaches. The chickens below helped themselves to all the fruit that crashed to the ground as my little fruit orchard and rose garden is also my chicken yard. I’m thinking about replacing my two young pomegranates with two more Belle of Georgia peaches so I can freeze even more peaches. I’m not a huge fan of cooked fruit and cobblers but it turns out I like cobblers with a batter on top instead of a flat crust. I do love cooked blueberries and devoured a blueberry cobbler made with my frozen blueberries from June. 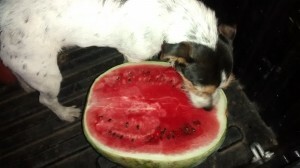 My terriers Acer, Ilex, and Lizzie love all fruit and have dined steadily this year on blackberries, blueberries, peaches, figs, and even watermelon! And I thought it was odd that they have been advertising blueberry bits in dog food. When she’s not looking cute as a button Lizzie would actually prefer to eat your hat, gloves, and shoes! Heck, for some reason this month’s entry turned into a food blog. Here’s my other promised BBQ sauce recipe I like best for adding to pulled pork. The tangy vinegar-tomato flavor pairs nicely with the smoky meat. Naturally you have your own favorite, but if you eat with me you’re going to get this one! Heat on the stove top and whisk until smooth. Store in the refrigerator.